“God’s Influence in the Powerful 7: A Novel” from Christian Faith Publishing author J. Andy Welch is the fascinating story of George Belten, a middle-aged married family man who experiences strange events in his life that all point to the number seven—like the numbers on his clock during sleepless nights—a baffling pattern that sends him praying and researching theology, until he finally understands the power behind the number and how God brings about miracles in his life and the lives of others through it. “God’s Influence in the Powerful 7: A Novel”: an intriguing story of a man whose life is transformed by the power of a divinely perfect number. “God’s Influence in the Powerful 7: A Novel” is the creation of published author J. Andy Welch, a retired automobile finance banker and company owner now living with his wife in Tallahassee, Florida, whose own life has been guided and blessed by the number seven..
Welch shares his main character’s strategy for using the number to help him break a quarter-century-long smoking addiction: “Today is Tuesday. Carol is out running errands. As this day goes on, he has already been in the shower three times! He watered the fruit trees twice, dug up and relocated three shrubs, walked around the neighborhood twice, and numerous other chores to keep him active and his mind off the habit and his addiction. On the computer, George decides he will set up a spreadsheet as his daily activity calendar extending through three months. Using a green ink pen, he begins to mark each day with a smiley face to indicate another day completed as a non-smoker. He believes the calendar will help him stay on course and highlights the seventh, fourteenth, twenty-first, twenty-eighth, and thirty-fifth day. Published by Christian Faith Publishing, J. Andy Welch’s new book is an amazing fictional work that brings to life the true real-world power in this divinely sanctified number, as experienced in the author’s own life encountering seven in many miraculous events. Belten’s story, influenced significantly by Welch’s firsthand experiences, will bring laughter, tears, and a newfound reverence for God’s perfect number. 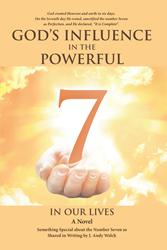 View a synopsis of “God’s Influence in the Powerful 7: A Novel” on YouTube. Consumers can purchase “God’s Influence in the Powerful 7: A Novel” at traditional brick & mortar bookstores, or online at Amazon.com, Apple iTunes store, or Barnes and Noble. For additional information or inquiries about “God’s Influence in the Powerful 7: A Novel”, contact the Christian Faith Publishing media department at 866-554-0919.